Group riding simply refers tobicycle-riding in groups. There’s really no specific numbers required for group riding. It can be with three cyclists or more. Group riding can be done in different ways depending on the condition. On a paceline, one or two riders will be at the front to lead and break the wind. 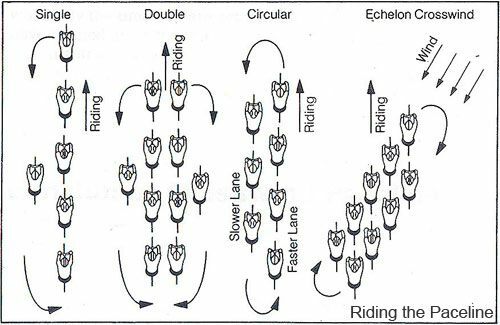 This formation is beneficial for riders at the back as this saves them more energy. They would require less effort since they need only to overcome minimum wind resistance. Bike riders will have to take turns at the front and change position though, to allow the previous rider they replaced to rest. Riding in groups is an efficient way to conserve energy compared to riding as a lone wolf because then you’ll have to do all the work of breaking the wind by yourself. Safety in numbers is also one reason why riding with other cyclists is good. You don’t want to be alone in the middle of nowhere if something bad happens. Riding with fellow cyclists could also be a good way to learn tips and acquire new skills. Plus, this is agreat way to socialize and make new friends. Group riding makes cycling more fun. Don’t race. It’s not about how fast or strong you are individually as a cyclist. If you wanted to prove your speed, better join a racing event. Obey the rules of the road. Stay on the right side of the road. Follow the rules. Don’t do sudden movements and actions. This include sudden changing of lines or directions and sudden braking or stop. Be predictable. You should always give a signal or tell your groupmates the changes or movement you’ll do as it may affect the pace of the ride. You don’t want to have a crash. Look ahead at the road.Knowing where you are going is very important in cycling. It will make you aware of the direction where you are going and some bumps you would want to avoid. Keep a proper distance. Make sure you have the right amount of distance with your mates. Do not overlap wheelsso that you have enough room to react to different situations or sudden movements of others to avoid crash. Learn to communicate properly. A good communication is a key to a successful group ride. Learn hand signals to indicate turns orstop. This is a good way to announce hazards on the roads or if you are having a problem. Straight or single paceline. The riders make one line, each drafting closely behind the next. The one on the front does the task of breaking the wind on a certain period andwouldthen ease out to the side until he is able go to the back of the line. This is normally used in sprint finish and time trial or for riders going on a high speed. Double paceline. Two riders take the lead on this formation. Once done on their turns, they would then ease out to the side of the lineuntil they are able to go to the back. On this paceline, riders can easily socialize with one another. However, this takes up more road space and may be prohibited by traffic laws on some areas. Circular paceline. This paceline is almost similar to double paceline except that riders change positions in circles. This formation is best used when the group’s riding against strong wind and it is too difficult to stay at the front for a long time. There would be a fast lane and a slow lane in this paceline. The one leading the group would be on the fast lane and would then have to move to the slower lane for others to take his position. Once a rider reaches the back of the slow lane, he would then have to move to the other side and accelerate. Echelon or Crosswind paceline. This is the hardest and the most dangerous type of pacelineyet also the most enjoyable to do. This formation is designed for crosswinds. Instead of lining up on a straight line, each rider is staggered to the rear flank of the one ahead to remain protected from the wind. The rider on the front would pull off to the direction of the wind (this would vary depending on where the wind is coming from) and would drop back until his front wheel cleared the rear wheel of the rider taking his position. The rider on the slower lane would then need to go to the faster lane once he is in the bottom. Signals are important since the riders behind the lead don’t have a complete view of the road ahead so they may not be able to see any road obstacle. You can also do a call indicating the hazards or the action to do. Slowing down: stretch your arms out and palm facing down then move your hand up and down at the wrist. This can be used when braking or when you want to slow down the pace. Stop: Raise your hands up. This would be used as a signal to stop or you can simply call stop loud enough for your ride mates to hear. Turn Indicator: Stretch your arms sideways to the direction where you would be turning (left or right). Road hazards: Stretch your arms downwards towards the direction of the road hazard, this can also be accompanied by a circling motion of the hand. Use this whenever there are potholes, drain cover, manhole cover. Oncoming hazard, Parked car: Put your arm behind your back and point out which direction the hazard is. Gravel, Debris, Ice: Outstretch the hand downward toward the direction of the hazard and do a waving motion with palms facing the ground. This is used when there’s something on the road that are slippery like ice. Come through: Flick your elbow out the direction where you want the person behind you to come through. Use this when you want someone else to replace you on the lead. Cattle Grid, railway tracks, speed bumps: Place your hand behind your back and draw a line horizontally back and forth at your back. Use this to indicate hazards across the road like cattle grids. Thanks, acknowledgement: Probably one of the most widely known hand signals. Simply give a thumbs up. Use this to say thank you. You can now start riding in groups and develop camaraderie with other cyclists. Expect group riding to be much more fun and enjoyable, too. Just remember to always keep safety in check.